Chula Vista, CA’s new all-electric vehicle fleet. Courtesy City of Chula Vista. In late March, leaders from ICLEI member City of Chula Vista, CA, and San Diego Gas & Electric (SDG&E) unveiled a fleet of brand new electric vehicles (EV) and an array of EV charging stations at City Hall, marking a major milestone in the two organizations’ partnership to accelerate clean transportation as a means to reduce air pollution and greenhouse gas emissions. 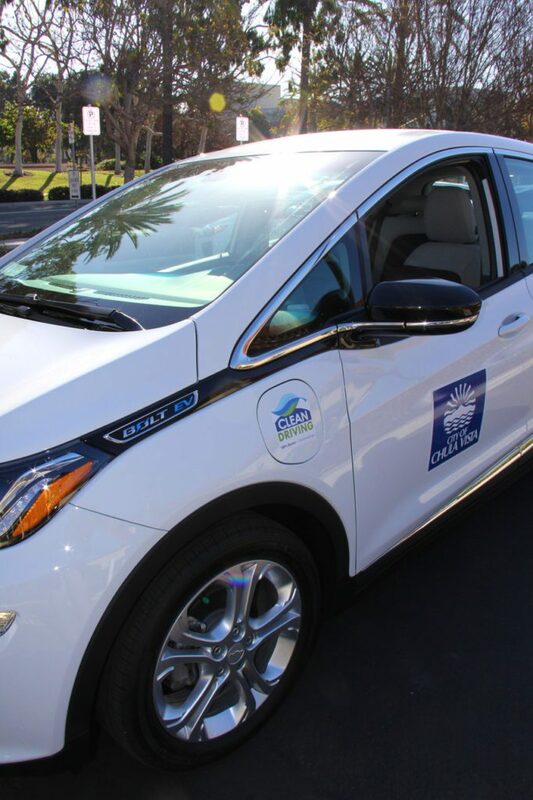 Powered by Measure P, the half-cent sales tax approved by 68% of its voters in 2016, the City of Chula Vista was able to purchase a fleet of 15 new long-range electric vehicles: 12 Hyundai Ioniqs and three Chevy Bolts. The vehicles will be deployed as part of the city’s senior volunteer patrol and code enforcement programs. Later this year, the city intends to double its fleet of low and zero-emission vehicles, bringing the total to about 30. As part of its Power Your Drive program, SDG&E’s clean transportation team has been working with the City of Chula Vista to install charging stations at its City Hall, Public Works Department and Police Department. A total of 123 chargers will be installed at city facilities. To date, 71 chargers have been installed and energized. In addition to cities, Power Your Drive brings charging stations to a variety of other locations, including apartments, condo complexes, and office buildings. A robust charging network is needed to help solve the problem of range anxiety, making it possible for more people to drive electric. One of Chula Vista’s new Chevy Bolt fleet vehicles. In the San Diego region, transportation accounts for about 50 percent of the greenhouse gas emissions. To help solve this problem, a growing number of cities and people are making the switch to electric drive, which is both environmentally friendly and potentially more cost effective. Electric vehicles generally cost less to maintain, as their engines have fewer moving parts. EV drivers also can take advantage of special electric rates to save on charging. At today’s press conference announcing the city’s new electric fleet and charging stations, Lawrence (Larry) Goldenhersh, President, Center for Sustainable Energy and representing the California Air Resources Board (CARB) presented Mayor Casillas Salas with a mock check for $150,000 – the total amount of state rebate incentives the city is receiving for purchasing EVs. SDG&E and Chula Vista — the region’s second-largest city — share a deep commitment to environmental sustainability in all its different facets, including energy efficiency, renewable energy, and clean transportation. Forty-three percent of the energy SDG&E delivers today to its customers comes from renewable sources. 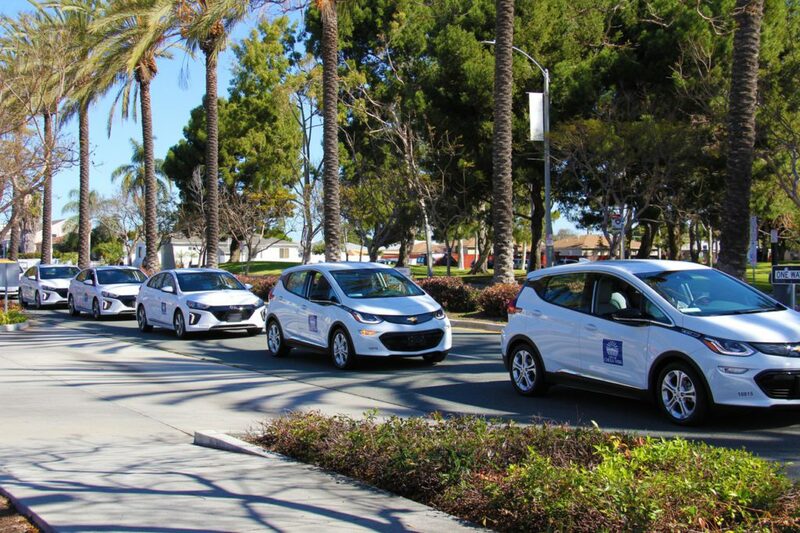 Learn more about SDG&E’s EV initiatives sdge.com/ev. Check out Chula Vista’s Climate Action Plan here. This entry was posted in CityTalk USA and tagged 100%RE, California, charging stations, electric vehicles, EVs. Bookmark the permalink.